We’ve had a few news stories recently about the adventures of the 118 118 Money Cardiff contact centre team as they raise money for Tenovus cancer care. From the tuneful (bucket collections at a choral concert) to the terrifying (flinging themselves off Cardiff’s St David’s Hotel on a zipwire). 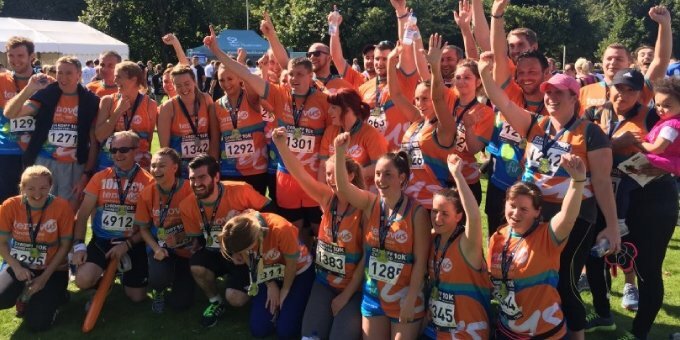 Last month saw the team tackle the Cardiff 10k, a famously exhausting 10 kilometre marathon through the heart of the Welsh capital, waving the flag for Tenovus Cancer Care by wearing their ‘EXTREMELY colourful’ jerseys. (If you don’t believe us, just take a look at the fetching luminous orange and blue ensembles the team’s wearing in the photos! A range of runners took part, from seasoned marathon pros to 10 complete running newbies, completing the race with a combined time of 11 hours and 36 minutes. Between them, they raised a total of £835, and that total is still rising as new donations come in via the team’s Cardiff 10K JustGiving page. It’s motivated me to start eating healthier foods and to exercise more often. It’s given me a chance to get to know colleagues in work by sharing fundraising ideas and encouraging each other to finish the run in the quickest time we can. Also, representing Tenovus enables me to raise money for a charity that is really close to my heart.